Mightyverse iPhone App hits 128 Downloads! In the first 2 weeks that Mightyverse has been available in the app store, we’ve reached 128 downloads! Okay, that’s not 128,000, or even 1,280, but still, for our utter lack of any promotion (not even a tweet yet), it’s pretty good. 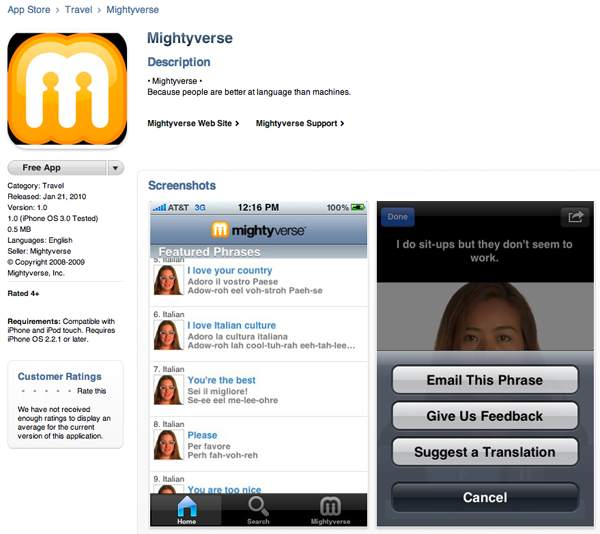 Why haven’t we promoted the Mightyverse iPhone app? Because it’s kind of dumb actually. It’s more of an experiment than a true representation of what we want people to experience when they use Mightyverse out in the world. What is our goal with the current iPhone app and why are we subjecting the goodwill of our future Mightyverse loving users to it’s paucity of functionality? Well, that’s a very good question. At this point the version you can download and install for free today is a subset of what we feel people need to have a useful experience of Mightyverse. The beta users of the next version of the app have given us great reports on travels to Japan, Italy, Russia and Europe. But the next version has some really great features the current public version lacks. I really don’t know many ways that someone could find a use for the current version. However….if you are excited about Mightyverse, the app does gives you a portable experience of all of the phrases in the database, with the current featured phraselist prominent on the homescreen. It provides us an easy way to have a lot of different people discover our content and experience it on their iPhones. You can look up any phrase that you know we have in the database and play it right there on your iPhone. You can even email phrases that you find in the database to your friends. “I’ve been using Mightyverse on my phone since the first version, the version that really sucked!”. We are busy working on the next version of the app which I think will be a marked improvement in usability and just a lot more fun. I can’t wait for you to try it out. Has anyone had value from the current app yet? Found a use for it? We are dying to hear from you. This entry was posted in iPhone app, News on February 4, 2010 by paul.